I finally had the time to take photos of the Searing Border Brothers. 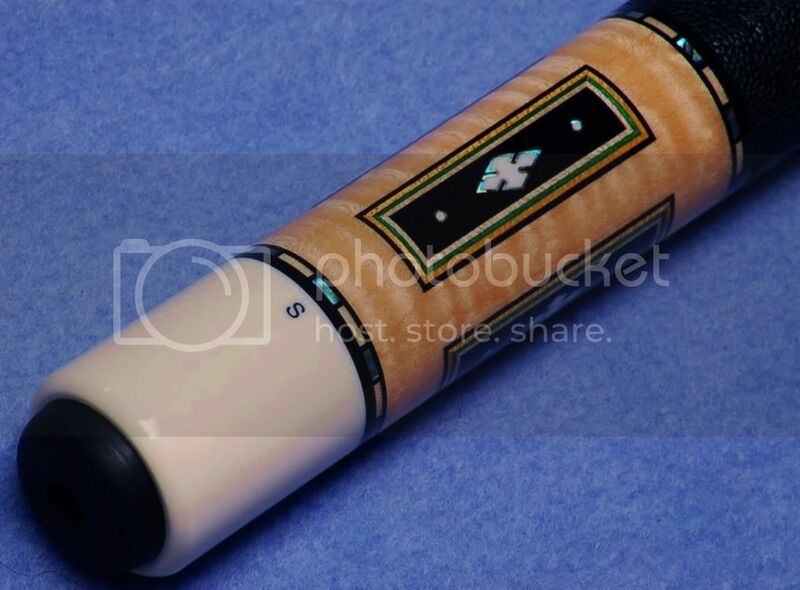 The birdseye maple cue has black, blue, golden yellow, and natural veneers. The hard curly maple cue has black, green, golden yellow and natural veneers. 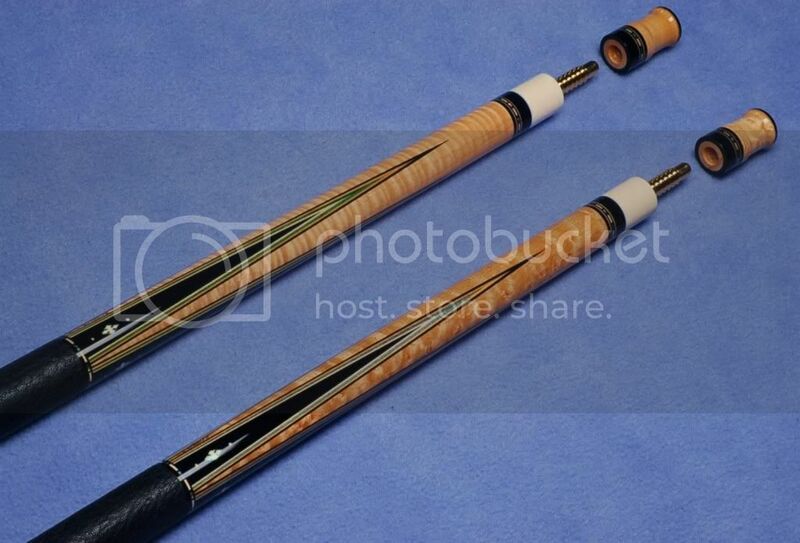 The cues are identical in all other respects except I had the blue veneer cue made with smaller size shafts as I knew I'd be keeping that cue for myself. More photos of the hard curly maple cue will be posted soon at www.superiorcues.com. The last 3 photos show the extraordinary detail of the paua shell borders with the slotted ivory diamond and dots inside. The deco rings also have paua with borders of ebony. 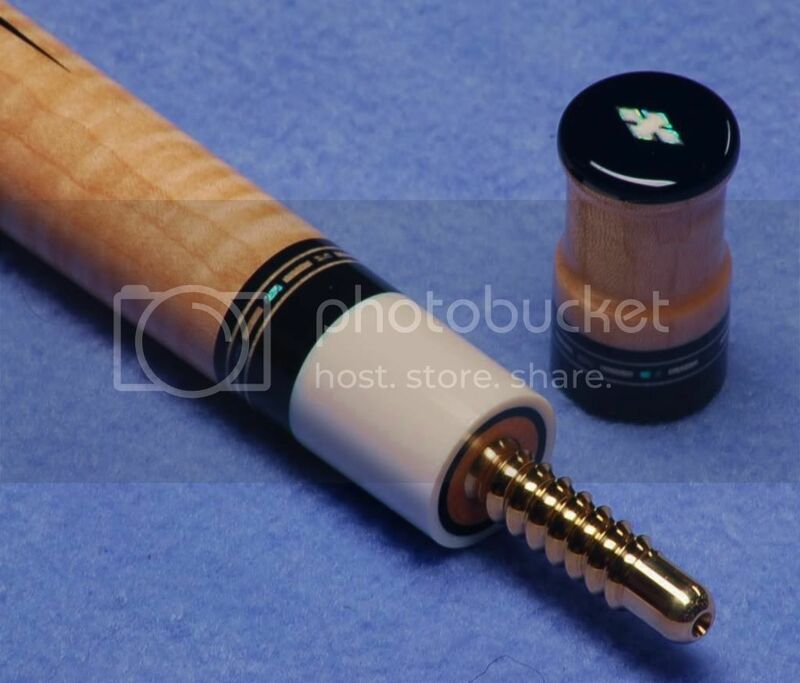 Painstaking detail and state of the art cue engineering from a renowned maker who is likely in the prime of his cuemaking career. Thanks again Dennis. Last edited by jazznpool; 02-26-2013 at 09:31 PM. More extraordinary work from Dennis. He really is a cut above. The paua shell sure shines out, doesn't it! Great cue. Now that's a beautiful set of cues. Green and blue, curly and bem..the best of both worlds. Thanks for sharing your cues. 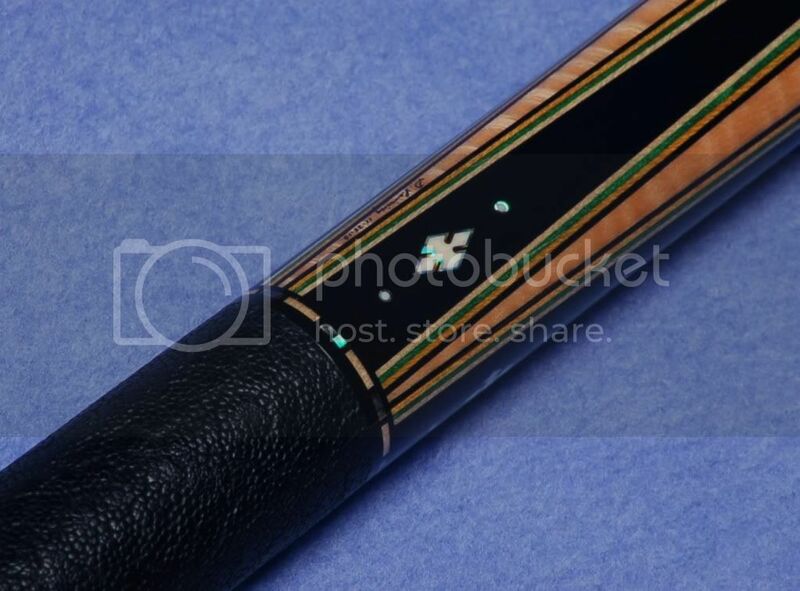 These cues are absolutely gorgeous, thanks for sharing. Dennis does some amazing work. Great looking cues Martin, looks like the wait was justifiable. It's amazing how those inlaid border windows never get old. They are one of my favorite old school designs, and Dennis did a great job bordering the ivory. Awesome set of cues Martin! The one thing I have learned very well is - Dennis does perfect! If that makes sense. There is nothing arbitrary with anything he does. Everything lines up and everything matches. I have never seen a cue from Dennis out of balance. And to top it all off, they play like a dream. Mine will be shipped from Dennis on Monday... Very excited to say the very least. Super sharp brothers!! and they deserve the crown "cue of the month" !! South West Cues Wanted!! Show me what you got!! These cues are awesome. Martin the pics don't do them justice. They are even better looking in person. I know they are perfectly balanced and both are flawless. Dennis's reputation is well deserved. He is fanatical in his detail to perfection. We all know the green/yellow one is the better of the two cues. Glad you got them, what a pair of cues. Dennis' work is amazing. Wow, What a perfect pair! I got to see these cues being made and those pics don't even begin to show how awesome they really are. Dennis did an amazing job on those monsters.